We do not have fancy Easter baskets in our house. I always meant to get nice Easter baskets that we would reuse every year, but it just never happened. So we use the inexpensive store bought colorful wicker baskets. The kids don't really mind. They are too distracted by the sugar inside to notice the basket. Now these candy Easter baskets would probably get noticed though. I love these small Easter baskets from Beth-A-Palooza. They would make fun party favors ore Easter treats to give teachers or neighbors. 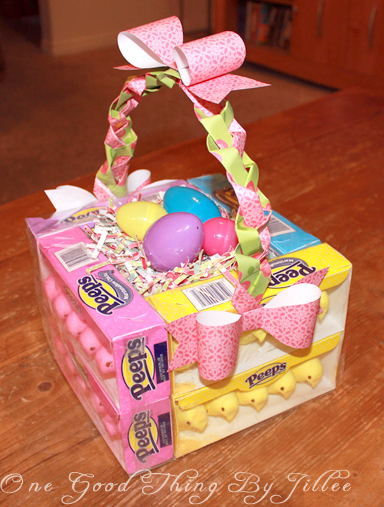 Jillee from One Good Thing took Beth's fun idea and made it a little bigger, using boxes of peeps to create this edible Easter basket that would work for your own kids. Either way, you won't have to store these puppies when the holiday is over! I love this springy creativity! So practical and colorful!